A fiberglass door will not warp, split, crack or rot. 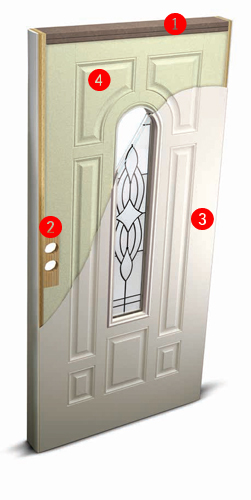 Composite materials protect the door at the top and bottom edges to help block moisture that can wick into doors. An enhanced lock block combined with 1-1⁄4″ lock and hinge stiles increases rigidity and stability. Fiberglass skins provide durability and long-term performance. A fiberglass door will not dent or rust, nor will it warp, split, crack or rot.